These background notes are to be read with the January 2014 post on future transport. 1. They use energy to accelerate away from traffic lights in town, or to climb hills. 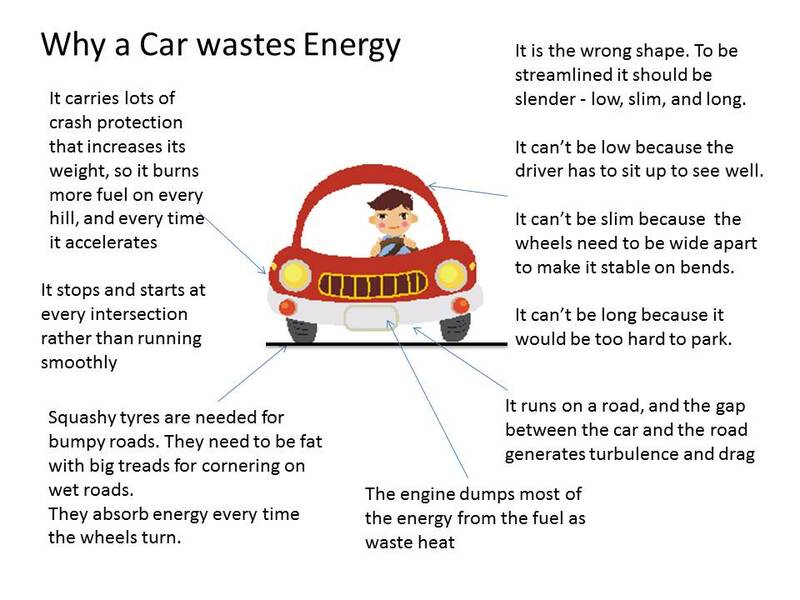 The energy needed is proportionate to the weight of the car, which needs to be high to provide protection in accidents. 2. They use energy to force their way through the air, which is the dominant loss when they are travelling fast. The energy loss is dependent on the area of the car when viewed from the front, and the shape. The more streamlined the shape, and the skinnier the car, the better. 3. The tyres and the internal components generate friction, and energy is required to overcome it. 4. Petrol cars only use around 25 % of the energy in the fuel. They dump the remaining 75% as heat. Diesels are slightly better because they use 40% of the energy in the fuel. That still isn’t great! Designers are making great efforts to reduce these energy losses and make a car more efficient. They are looking to recover energy lost in braking. They are making cars as streamlined as they can. They are cutting friction losses. They are developing electric vehicles. All of those developments are important because whatever happens we are likely to continue using the car quite extensively. However there are limits to what can be achieved. A car runs on roads so it must use relatively soft, wide rubber tyres to absorb the bumps and to grip on wet corners. The tyres with the lowest rolling resistance tend to be hard and narrow. Cars can never be perfectly streamlined because they run on a road. Their shape has to be wide to make them stable on corners. They have to have a flat bottom surface near the road, which is inherently less streamlined than a curved surface away from the ground. They can’t have a fully tapered tail, because its shape is a compromise against space for luggage and rear passengers, and the car needs to be short to be easy to park. Electric vehicles are good, but batteries are much heavier than petrol or diesel for the same energy storage, so battery cars tend to be heavier, costly, and have limited range. Quite apart from the energy consideration we pay a high price for cars. Over 30,000 people die on US roads annually, ten times more than in the 9.11 attacks. The UK has some of the safest roads in the world but still kills around 2000 people each year. Worldwide road deaths are over 1 million a year. Injuries are many times greater. I called my sketched PRT system the Swift. The shape of the Swift is a classic streamline, with a rounded front and a tapered tail, so that the air closes smoothly behind the vehicle and little energy is lost in making turbulence. A swift bird is a tremendous flyer, and its body is a very similar shape to the Swift pods. In an energy limited world it is crazy to travel quickly in a device that is not properly streamlined. The tyres of the Swift can be inflated hard because it runs on a smooth steel surface. Separate wheels can be moved into place and used for emergency braking. The weight of the Swift can be reduced because it will be computer controlled, so the pods do not need to be built to survive collisions. Safety authorities will of course need convincing on this point and that may require some years of safe operating experience, but aircraft need no such protection. What about other types of public transport? Won’t Jim use buses? In cities, maybe. Their slow speed matters little in a city because distances are short, and heavy traffic and difficult parking makes the car inconvenient. Outside the city, however, a car is normally faster and more convenient than a bus, and because buses are often less than half full their energy efficiency is not good enough. What about trains? When fully loaded they can be both fast and efficient. They are great for longer journeys and for high capacity metro systems in cities. Swift could never beat them for those duties, but the systems could be complementary. Swift may even replace some suburban stations so that trains could travel faster with fewer stops. Swift could travel at 60 mph or more. The top speed would depend on the requirement for bends at intersections and to avoid buildings, and on the straightness, stability and stiffness of the track. Design work will be needed to establish what is possible. Standard vehicles might contain one person, or an adult and child. Larger vehicles would have higher capacity. Typical journey lengths might be between 1 and 40 miles, a range that covers many car journeys. The car would be used less frequently because there would be a faster, lower energy alternative for many journeys. Many of the potential benefits of Swift are obvious, but the economics are currently less clear. No-one can predict the cost of energy in 2050. No-one can predict whether global pressures will dictate severe reductions in fossil fuel use. It is not easy to predict what safety features will be required and they will have a significant effect on costs. If the world waits for the economics of these systems to be proven we will wait far too long. It may take 20 or 30 years to get systems like this right, to make them reliable and to find the best blend of safety and economics.